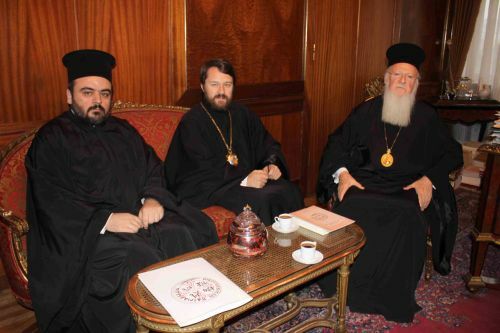 On 15 December 2012, the 28th Week after Pentecost, Metropolitan Hilarion of Volokolamsk, chairman of the Moscow Patriarchate’s Department for External Church Relations (DECR), visited the Church of St. Nicholas in Istanbul at the invitation of His Holiness Patriarch Bartholomew of Constantinople. He prayed together with His Holiness at Matins and at the Divine Liturgy celebrated by archimandrite Bessarion (Komzias), the great hierokiriks of the Patriarchate of Constantinople. Praying at the divine service were Metropolitan Irinaios of Myriophyton and Peristatis, in whose canonical jurisdiction the Church of St. Nicholas is; Metropolitan Anthimos of Alexandropoulis, Orthodox Church of Greece; Bishop Seraphim of Phanar; archpriest Vsevolod Chaplin, chairman of the Moscow Patriarchate’s Synodal Department for Church-Society Relations; archpriest Nikolai Balashov, DECR deputy chairman, and other members of the delegation accompanying Metropolitan Hilarion on his visit to Turkey. Attending the service were H.E. Vladimir Ivanovsky, Ambassador Extraordinary and Plenipotentiary of the Russian Federation to the Republic of Turkey; Alexei Yerkhov, Consul General of Russia in Istanbul; and a large group of young people from Greece. After the Liturgy, Metropolitan Irinaios of Myriophyton and Peristatis greeted His Holiness Patriarch Bartholomew and guests from the Russian Orthodox Church and the Orthodox Church of Greece, saying that the worshippers were glad to see a renowned hierarch of the Russian Orthodox Church. In his primatial homily, His Holiness Patriarch Bartholomew expressed his joy over common prayer with the delegations from the Russian Orthodox Church and the Orthodox Church of Greece, noting that representatives of the three sister Churches have gathered together to offer up their prayers for the widowed Churches of Antioch and Bulgaria and for the soonest election of their new primates with whom we shall work for the unity of Orthodoxy in common witness to the contemporary world. His Holiness addressed pilgrims from Greece; Metropolitan Hilarion, noting his responsible ministry in the Russian Orthodox Church; and Russian Ambassador and Consul General. “We have arrived in this city, sacred for all Christians, to pray with You in this church and to discuss a number of important issues. Orthodox Christians have lived in this land for many centuries in spite of all tragic events in history and have firmly maintained Orthodox faith. We admire the courage of those Christians who have stayed here to keep their faith and pass it to their descendants. “Your Holiness, we pray for Your health and prosperity and for the growth and establishment of the Holy Church of Constantinople dispersed in the world, and also for the strengthening of Orthodox faith in this country, where the number of Orthodox Christians has increased recently as it includes the Russian-speaking worshippers coming here to visit or to reside. We thank You for Your pastoral care for these people and for appointing archimandrite Bessarion to meet their spiritual needs. At the repast, which followed the service according to the Greek tradition, the young people who arrived from Greece sang national songs and hymns and performed instrumental compositions. Metropolitan Hilarion had a talk with His Holiness Patriarch Bartholomew at the residence of the Patriarchs of Constantinople at Phanar. Issues of mutual interest were discussed. That same day the DECR chairman and his suite left Istanbul for Moscow. They were seen off at the airport by Ambassador Ivanovsky and Consul General Yerkhov.